Famous for being the setting of a Coen Brothers film, Fargo often surprises visiting tourists. 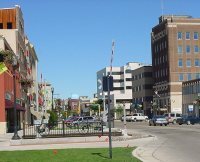 Fargo is home to several universities, a minor league baseball team, several theatres, art galleries and museums, a zoo, and a horse-racing track. Fargo is on the border of North Dakota and Minnesota, and shares a metro area with the city of Moorhead across the border. With a number of universities and colleges between the two cities, the population of Fargo-Moorhead is always young and energetic, and ensures a bustling nightlife. Buildings are designed to ensure people go outdoors as little as possible, as winters are notoriously harsh and inhospitable. Fargo is also a popular stop on road trips across the northern US, acting as a gateway to the outdoor pleasures and pursuits of North Dakota. These activities include hiking, canoeing, fishing, golfing, horseback riding, biking, and camping in summer, and snowmobiling, skiing, and ice fishing in winter. A holiday in Fargo combines the best of both city and country life, making it an ideal destination for those who can't decide.